To close the cover, attach the upper part of the back cover and press firmly on each part in order. Ensure that the back cover is closed tightly. Use only Samsung-approved back covers and accessories with the device. The final step in sealing your device is to ensure the snap point just around to the left side of flash is closed. Q: Can I use my Galaxy S5 device in Sea water or a Swimming pool? A: We advise not to expose the device to water at high pressure, and avoid immersing the device in hot water, salt water, ionized water or soapy water. Q: Can I use my Galaxy S5 device in a Bathroom? A: We advise not to use the device when the device is in very humid places, such as swimming pools or bathrooms. Q: After my Galaxy S5 device has been underwater, will the earphone speaker work immediately after leaving the water? A: Your device should not have any problem and the earphone speaker should work as normal. However, please dry it thoroughly with a clean, soft cloth before attempting to use the device. Q: If the area around the multipurpose connector of my Galaxy S5 gets wet, can I charge my device using the charger or USB cable? 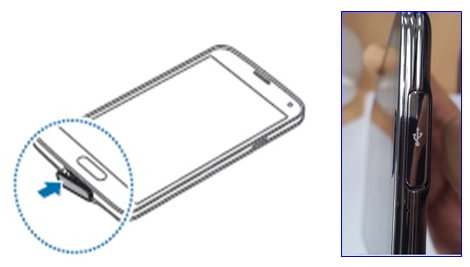 A: If the device has been immersed in water or the area around the Multifunction connector is wet, please wipe device with a clean, soft cloth and allow the device to dry. Once the device has dried, you can charge the battery. Q: The device vibrates slightly when music is played at high volume, and a “bell like” sound can sometimes be heard. What’s the problem? 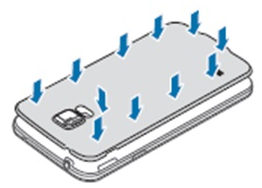 A: The water-resistant design of the Galaxy S5 causes it to vibrate slightly in certain conditions. This is not a fault, and it does not affect the device’s performance. A: No. Due to the design of the Multipurpose jack cover to protect the device again water and dust ingression, desktop dock/multimedia dock (Smart Dock)/audio dock used on older models are not compatible.